City Classic Zagreb apartment is located in the heart of the city and the pedestrian zone, in Chapter 4. Floor of the building built at the beginning of the 20th century. Century and is equipped with an elevator - with a view of the main Ban Jelacic Square and Central Market Dolac. The apartment is fully furnished and equipped, with air conditioning and high speed Wi-Fi with indefinite useful life, is located in the center of all cultural and business activities, and thus is an excellent choice for every travel occasion, whether or with your family, friends business trip. The apartment consists of a large living room, two bedrooms, kitchen, bathroom, separate toilet, large hall and loggia balcony. The apartment offers two flat screen cable TV, DVD player, Hi-Fi, radio, laptop, printer, MP3 inclusion, fridge, freezer, dishwasher, microwave, toaster, kettle, coffee maker, dishes, dining table, dishes and all necessary utensils to cook and serve, as well as washing machine, dryer, hair dryer, toiletries and - Elliptical Trainers OrbiTrek. There are always plenty of towels and linen provided. We also provide a mobile telephone, iron and ironing board, a baby travel bed, books and games for children for your pleasant stay. Smoking is allowed in the Loggia. We will do our best and hope to expect to feel beautiful and to make your stay enjoyable! Parking in the public garage is the simplest and cheapest solution. If you report the estimated time of arrival, we can meet you at the house or in the public garage nearby. The parking garage Tuskanac is recommended. The Zagreb Pleso Airport is 17 km away. You can opt for public transport: the shuttle bus to the central bus station (30 kn / person) and then take the tram line 6 to the Ban Jelacic square (10 kn / person) to continue. We also can arrange your transportation from the airport to the city with the local taxi driver. The main railway station is 1 km from the apartment. You can take the tram line 6 (2 stops) or take a taxi. It's also on foot in about 15 min, the route Tomislav Square, Strossmayer Square and Zrinjevac Park along. The central bus station is approximately 2.5 km from the apartment. From there, take the tram line 6 to the Ban Jelacic Square (5 stations) or on the spot or you can take a taxi. The BATHROOM - with shower and toilet, a washing machine and an extra dryer for laundry. There is also an extra toilet in the apartment. The towels there are always plenty available, and the shower gel, shampoo ... and a hairdryer. I almost passed on this apartment since the furishings seemed dated. I am SO glad that I did not. It is Duba's childhood home and you can almost feel the family laughter that had taken place here. You could not find a better location. 1 min walk from the city center. Easy access via expresd bus from the airport. We very much enjoyed the apartment. Duda , the owner was so accommodating. The apartment must be over 1000 sq ft and is equipped with more than you can hope for. It is located right in the heart of the main city. You will not be disappointed is you're not this apartment! Thank you so much for a great review! It was very nice to meet you and thank you for leaving the apt so clean. I hope to see you again on another occasion! Our stay in Zagreb couldn’t have been better thanks to this lovely appointed apartment in the perfect location, accessible to everything. Our hostess, Duda, was great at sharing her tips and suggestions. What a wonderful experience! Thank you very much for the great review. I am so glad when the guests feel comfortable, enjoy their stay in the apartment and bring some nice memories back home! Thanks! Kind regards, D.
We spent 6 nights in the apartment and left having had a very good experience. The apartment truly is 'central' to the heart of Zagreb. Everything is close at hand. It was a great place to return to after a day of exploring the city. The apartment itself is large and bright and very well furnished. Everything was exceptionally clean. The two large bedrooms suited our needs perfectly. Two WC's as well. The best part was the attention to detail - the kitchen was well stocked with everything needed to cook, and the basics were supplied in the fridge. Also, the owner was very helpful in providing advice and help on any issue, including providing a cell phone for local calls. It is a premium, comfortable and welcoming apartment that we would recommend to anyone wanting to be steps away from the main square of Zagreb. Spacious, everything you need is available. In the city centre. Friendly owner. We spent 2 nights in the apartment and it a very good experience. 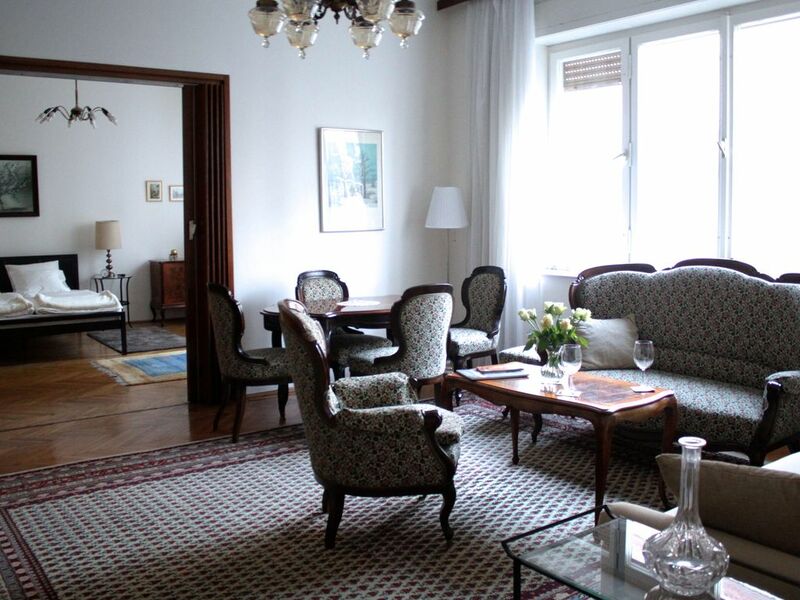 The apartment is a few meters of the main square of Zagreb. It was a great place to return to after a day of exploring the city. The apartment is large, bright, very well furnished and clean. The kitchen was well stocked with everything needed to cook, and the basics were supplied in the fridge. The owner, Duda, was very helpful, polite and kind since the first contact by e mail. It is a premium, comfortable and welcoming apartment that we would recommend to anyone wanting to be at the heart of Zagreb. Zagreb was a nice surprise to us. Two days was less than one need to see Zagreb. Top location in the heart of the city, in the middle of the pedestrian zone with an eye to the main square and Farmer's Market Dolac. All other sights and attractions are within easy reach - mostly on foot or by tram. The tram stop is just around the corner. The main train station is two tram stops and bus station four stops. Falls Sie nur eine Übernachtung buchen möchten, können Sie es nur Last Minute, bzw. nicht früher als eine Woche in Voraus machen. In diesem Fall wird ein Aufschlag von 25 % auf den Einzelpreis zugerechnet.